A lovely, circular walk around Uiginish. 2 miles. 1.5-2 hours. Uiginish is sign-posted off the B884 Dunvegan to Glendale Road about two miles from Dunvegan. Park in the farm yard at the road-end being careful to leave room for lorries to turn. Go through the five-bar gate that is beside Uiginish House and bear right diagonally across the field to get some spectacular views of Dunvegan Castle across the loch. Continue straight on until your way is barred by a fence. Turn left and follow the fence until your reach a pair of five-bar gates. Take the furthest away of the two gates and then bear right. You will see the small hill at Uiginish Point and you should head towards the left-hand side of the hill. Climb the hill for panoramic views through 360 degrees of Dunvegan, Macleod's Tables and the Cuillins. 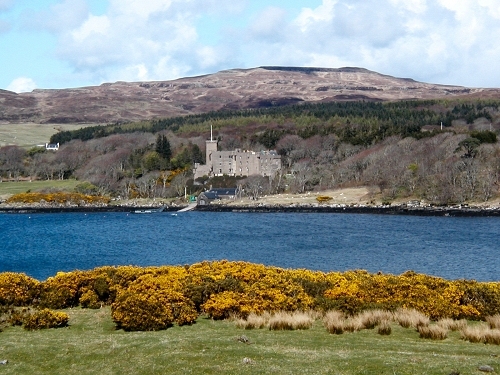 Dunvegan Castle, as viewed from Uiginish. Descend back down the left flank of the hill and follow the coastline around Biod na Fhithich to Ob Dubh. You will notice some fascinating ancient slipways in the bay here. At the head of this bay, your way is blocked by a fence. Turn left and you will meet up with a wide track that heads back to Uiginish Farm. This track passes on the right hand side of a small hill on which you will notice a lot of fallen, dressed stones. Climb this knoll to explore the relatively well preserved ruins of Dun Totaig. Then continue along the track back to the farmyard and your car, being very careful as it can get extremely boggy with slurry from a cattle feeding station near the farmyard. 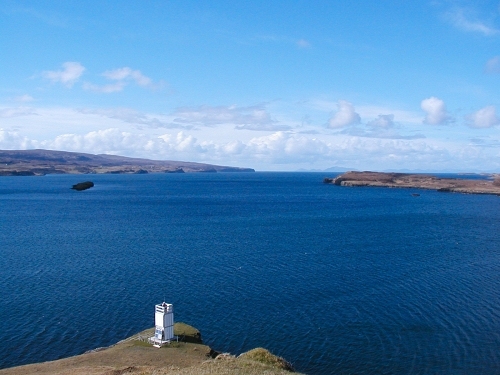 Uiginish Point Lighthouse and Loch Dunvegan. There was a hen harrier photographed on a fence post in her garden at Skinidin (Jeni Neale).